One of Nigeria’s biggest musical tours is here again. Yes, it’s the annual Star Trek musical tour that cuts across the country, parading some of the finest Nigerian artistes as they thrill the crowd with laudable performances. The countdown has begun as Nigerian Breweries Plc, manufacturers of Star Lager beer, announced the lineup of activities for the 2011 edition of Star Trek. A press conference was held on Tuesday, May 11, 2011 and was attended by officials from Nigerian Breweries Plc, key players in the music industry as well as some of the top musicians the country has to offer such as Banky W, P Square, Naeto C, eLDee da Don, Ruggedman, Sound Sultan as well as Durella, Jaywon, The Pulse, MC Loph amongst others. Marketing Director, NB Plc Mr. Jacco Van Der Linden described the musical concert as one of the three major shows put together by Star, referencing the other two, which are the recently concluded Star Quest musical talent hunt and the forthcoming Star Mega Jam. ‘Star Trek is a music concert tour that showcases the best Nigerian music Stars. It is aimed at enlivening the social atmosphere in Nigeria and to demonstrate STAR’s core values of fun, brightness, sociability and celebration. As usual, we will be spreading the Star brightness and friendship to different parts of the country’, Mr. Jacco Van Der Linden disclosed. The artistes had something to say too as they took turns to promise that they would live up to expectation by giving the best of performances at every show. ‘I’ll I want to say is that we are ready and I’m glad this is happening again’, Paul Okoye said. ‘This will be the first time for me to perform at Star Trek. I’m thankful to be performing at an average Nigerian crowd, I’ll be hoping to perform song from my album that go in tune with the crowd’, Storm Records Naeto C disclosed. I’m excited to be part of this year’s edition of Star Trek. I’ve participated in Star Trek music tour in the past. I love Star Trek because it provides the opportunity for me to go to towns and places I’ve never been before’, Banky W gladly expressed. This year’s edition of Star Trek, which will hold from Friday, May 27, 2011 to Saturday, June 25, 2010 and will cover 10 towns. The towns where the music concert will hold are Abuja, Auchi, Asaba, Nnewi, Enugu, Owerri, Port Harcourt, Aba, Lagos and Ondo. The artistes billed to perform at this year’s edition are P Square, Naeto C and Banky W, D’banj, Faze, Ruggedman, 9ice, M.I, Timaya, Wande Cole, Dr. SID, Pheel and Obesere. 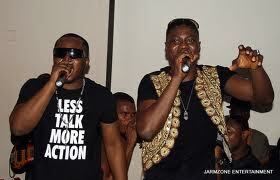 Other Nigerian artistes lined up to thrill crowds include Sound Sultan, eLDee da Don, Duncan Mighty, Mr. Raw, KAS, Yinka Best, Flavour, Jesse Jags, J. Martins, Durella, Mc Loph, 2 Shotz, Jaywon, Femi Adeyinka and Freewindz. In addition to the host of artistes, the newly crowned B.E.A.T, winners of Star Quest 2011 will also join past winners KC Presh, Diamondz, Juke Box and The Pulse on the musical tour. Star Trek was introduced in 2002 as an annual nation-wide musical tour that parades the best of Nigerian artistes across 10 Nigerian cities.